Kasnavi Yazdi, H., Fathalizadeh, Y. (2014). Relationship Between Sick Building Syndrome With Headache and Drowsiness. 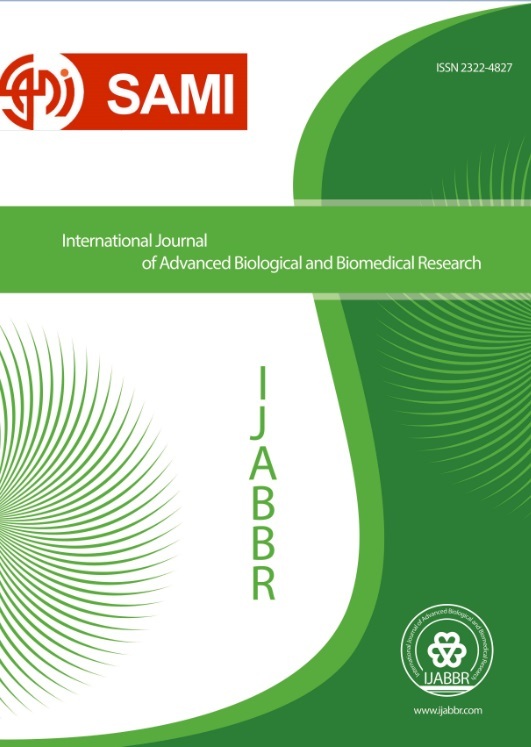 International Journal of Advanced Biological and Biomedical Research, 2(2), 510-516. Hamid Kasnavi Yazdi; Yaser Fathalizadeh. "Relationship Between Sick Building Syndrome With Headache and Drowsiness". International Journal of Advanced Biological and Biomedical Research, 2, 2, 2014, 510-516. Kasnavi Yazdi, H., Fathalizadeh, Y. (2014). 'Relationship Between Sick Building Syndrome With Headache and Drowsiness', International Journal of Advanced Biological and Biomedical Research, 2(2), pp. 510-516. Kasnavi Yazdi, H., Fathalizadeh, Y. Relationship Between Sick Building Syndrome With Headache and Drowsiness. International Journal of Advanced Biological and Biomedical Research, 2014; 2(2): 510-516. Based on previous researches and current research indoor contaminations in most of the time were more than outdoor contaminations. In according to, most of our times have been spent in indoor environments (85-90%), therefore, it is necessary to investigate indoor environments. Symptoms of sick building syndrome are Headache, dizziness, drowsiness. Unknown reasons of disease above mentioned and improvement and Fixing problems have emerged in people after moving from these buildings. In this research, we investigated basic symptoms of syndrome in illnesses of sick buildings. We designed a questionnaire and asked from male of dormitory residence. Questions of the questionnaire were more about known symptoms of buildings (Shortness of breath, inflammation, swelling and burning eyes, runny nose, malaise and fatigue, drowsiness, headache). Results of research indicated that lack of ventilation system, noises, contaminated materials, cars smoke, noses of crowded streets and high humidity are that most important reasons of sick building syndrome respectively. Daisey JM, Angell WJ, Apte MG. Indoor air quality, (2003) ventilation and health symptoms in schools: an analysis of existing information. Indoor Air; 13:53–64. Hodgson, A. T.; Daisey, J. M.; and Grot, R. A. (1991). "Sources and Source Strengths of Volatile Organic Compounds in a New Office Building." Journal of Air and Waste Management Association 41(11):1461–1468. Lynch, R. M., and Kipen, H. (1998). "Building Related Illness and Employee Lost Time Following Application of Hot Asphalt Roof: A Call for Prevention." Journal of Toxicology and Industrial Health 14(6): 857–868. Mendell, M. J.; Fisk, W. J.; Deddens, J. A.; Seavey, W. G.; Smith, A. H.; Smith, D. F.; Hodgson, A. T.; Daisey, J. M.; and Goldman, L. R. (1996). "Elevated Symptom Prevalence Associated with Ventilation Type in Office Buildings." Epidemiology 7:583–589. Menzies, D., and Bourbeau, J. (1997). "Building-Related Illnesses." The New England Journal of Medicine 337(21):1524–1531. Meyer HW, Wurtz H, Suadicani P, Valbjorn O, Sigsgaard T, Gyntelberg F, (2004), Molds in floor dust and building-related symptoms in adolescent school children. Indoor Air;14:65–72. Saijo Y, Nakagi Y, Ito T, Sugioka Y, Endo H, Yoshida T. (2010), Dampness, food habits, and sick building syndrome symptoms in elementary school pupils. Environ Health Prev Med;15:276–84. Sebastian A, Harley W, Fox A, Larsson L (2004), Evaluation of the methyl ester O-methyl acetate derivative of muramic acid for the determination of peptidoglycan in environmental samples by ion-trap GC–MS–MS. J Environ Monit;6:300–4. WHO (2009), Guidelines for indoor air quality, dampness and mould. Copenhagen, Denmark: World Health Organization. Zhao Z, Sebastian A, Larsson L, Wang Z, Zhang Z, Norbck D. (2008), Asthmatic symptoms among pupils in relation to microbial dust exposure in schools in Taiyuan, China. Pediatr Allergy Immunol;19:455–65.